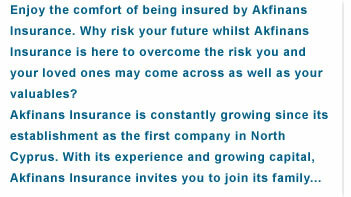 Akfinance Insurance Ltd. is established in 1996 as one of the first local insurance companies in North Cyprus. Before this structural change, we were the sole agent of a leading overseas insurance company for six years. Akfinance Insurance writes policies in every branch of non-life. We guarantee effective service throughout North Cyprus with the help of our selective agencies that numbers more than 40 as of 2007. As strong believers in technology, we also provide service on the Internet both as B2B and B2C, that is to our customers. In 2006 a new branch in Yeni Kent G�nyeli was opened making a total of five main Akfinance Insurance branches on the island. The K.Kaymakl� Branch which was opened in 1998 also works as the claims office. Akfinance Insurance has an insurance background starting in 1990. For all these years, our company philosophy has been to give the best service possible for its worth price and not go cheap at the cost of bad service. It is the result of this philosophy that we made a firm and trustworthy position in the insurance market in North Cyprus. In our sector, we need to establish a tight, yet fragile dialogue with our customers. It is the nature of our job to contact our customer when something unpleasant happens to them. Consequently, it is our duty to inform the customer of the policy coverage at the very beginning. We consider any other possibility unethical. As an end-user of insurance anyone and any legal entity can be our client. You can insure your car against traffic accidents, theft, fire, third party liabilities or insure your house and belongings against fire, theft and so on. Loved ones can be insured against accidents. In North Cyprus, T.P. Liability Insurance is mandatory. Every vehicle in traffic must have insurance where minimum coverage limits are stated by the State. We are here to serve our clients. Starting for the year of 2001, we began printing nostalgic photographs for our calendars. For two years in a row, the photographs below were published. The calendars have seen great interest among our clients as well as others. We hope that you enjoy them, too.